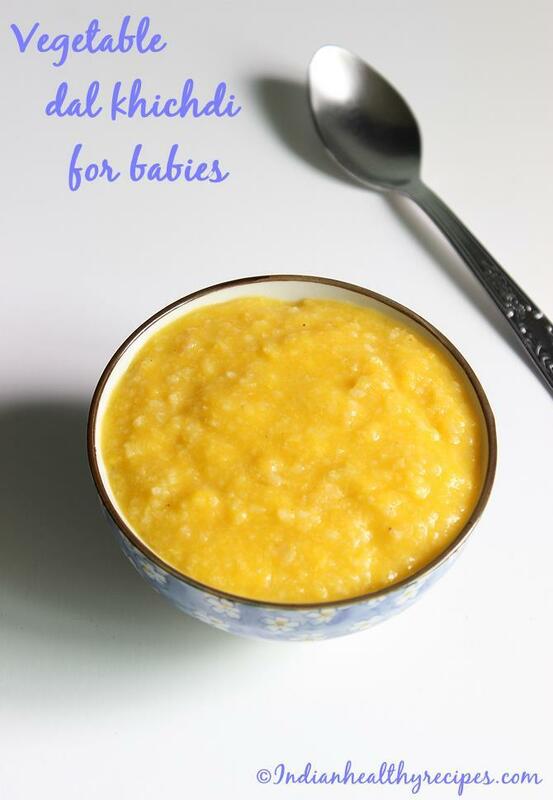 Indian baby food chart along with a list of tried & tested 60 Indian baby food recipes. Thanks to the readers who led me to this post on Indian baby food chart. Before I take you to the details of the food chart and the food recipes, please be informed that this post is based on my experience. I have honestly expressed my views and opinions on easy baby weaning so that it could be helpful to new mothers. Please read the comments below before posting your queries since similar queries may have been answered. Well, some of my tips might look like old wives tales since they are based on Ayurveda, but I do trust them in growing healthy and happy babies. However I suggest consulting your elders or pediatrician before you follow any new foods or tip that have been mentioned here. For the past several years, I have been consistently sharing & updating baby recipes especially for a good weight gain. You can find all the latest recipes or ideas on the baby toddler recipes section. Readers who have been asking for suggestions on foods to gain weight, please check this detailed post on best foods for weight gain in babies & toddlers. Is this baby food chart suitable to my Baby? This Indian baby food chart is a generalized one suitable for most babies. However i suggest you to use your judgement whether to include or not, certain ingredients in your babies diet based on your babies allergies, intolerance, appetite, likes and dislikes. 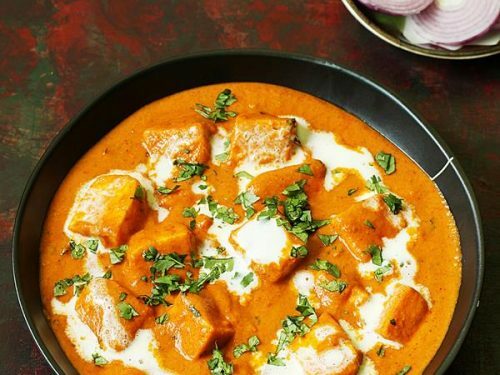 I have tried to link most Indian baby food recipes that I have posted earlier on this blog. 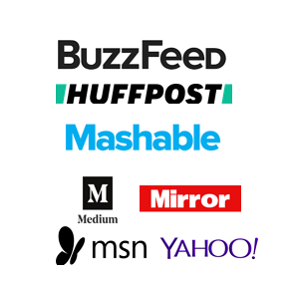 Many were written almost 5 years ago and are updated regularly with new tips based on the readers reviews. 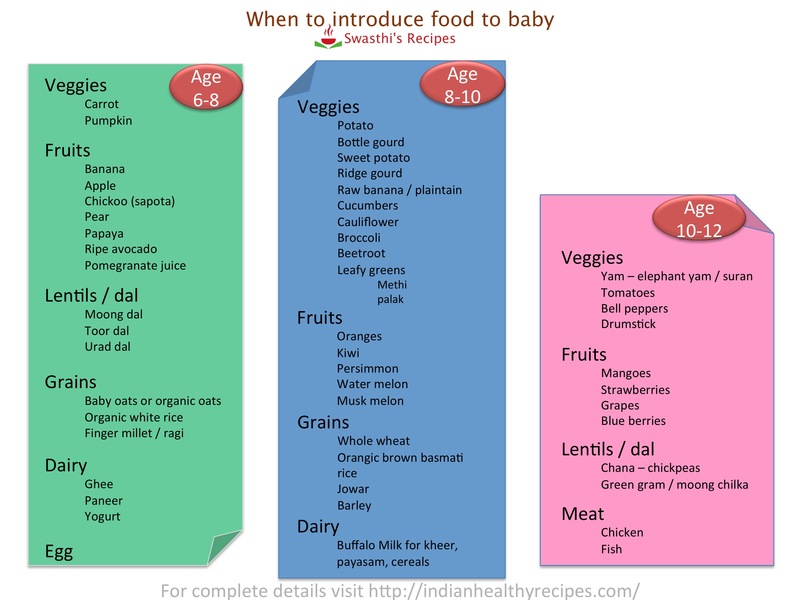 This Indian baby food chart was developed by me based on what i fed my 2 kids, whose birth weight was 3.3 kgs and 3.4 kgs. The ideas were basically drawn from the health and baby weaning booklets that were given to us during our visits to the singapore clinics, hospitals and few from clinics in Bangalore. This chart is also suitable to babies who were preterm born or were underweight. However I suggest mums with such babies to consult a pediatrician if you are skeptical about these foods. This post will be updated, to include tips and other information. You can leave a comment here if you want to know anything specific which will be answered. Please feel free to share or discuss your experiences, views, problems that you encounter while weaning your babies in the comment section. It could be helpful to other readers, it’s through sharing we can learn. Here is a brief guide on the right time to introduce foods. But how to introduce them can be found in the recipe posts. Example: Oats or oatmeal – I have mentioned clearly how to choose them and the kind you can use and how to prepare it for a baby. You can find a a detailed baby food chart for 6 months old baby here along with recipes. 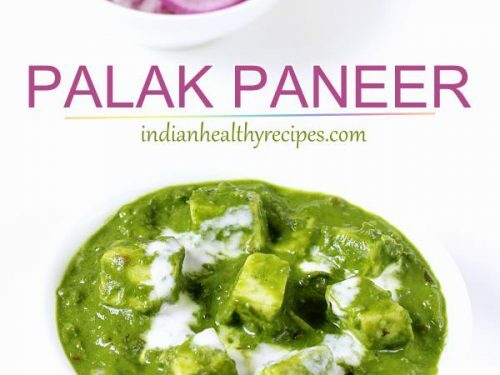 This Indian baby food chart and the baby food recipes have been developed for a good weight gain in babies. Soak them for about 2 to 4 hours in warm water before cooking. Discard the water. 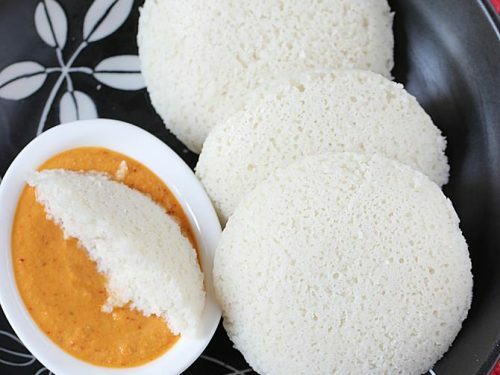 Use hulled foxtail millets known as thinai arisi/ korra biyyam/ navanakki- for babies above 10 months. Please Note: Feeding late can cause indigestion and the infant may not sleep due to colic. Avoid feeding heavy foods. Dinner should always be light, nutritious, mostly vegetable based. For babies from 10 to 12 months prefer light foods from breakfast section. Avoid egg & nuts. Babies above 12 months : Any foods mentioned in the breakfast and lunch can also be served for dinner. Soft Rice with tomato rasam and light steamed or cooked vegetables. 1. Try to serve fruits 1 ½ to 2 hours before a meal. They tend to make the infant feel hungry naturally. Do not serve fruit with a meal. 2. 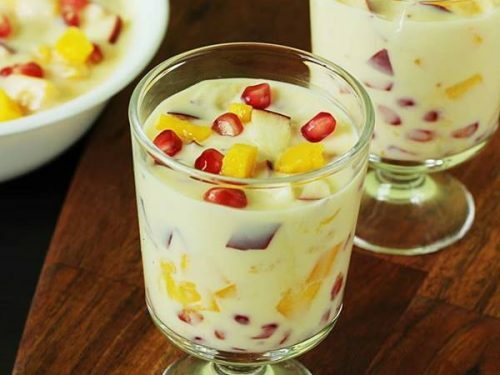 Do not mix fruits with dairy especially milk. It leads to indigestion. 3. Babies need exercise, let them play and crawl or run around. Don’t confine them to a small area. For toddlers / babies who can walk, a small walk in the neighborhood before a meal can make them hungry. 1. If you have a very fussy baby, avoid milk in the early morning and serve milk based breakfast mentioned in the table. 2. Serving bread or any other baked stuff to babies, leads to colic or bloating due to the ingredients like baking soda, powder, yeast etc. 3. Limit crackers or biscuits to only once a day, avoiding is however better. Thanks.Its a very helpful post. How can I print the diet plan? Hi, im suganya from chennai.. im mother of 1yr girl baby she’s premie baby born with weight 948gm now her weight 5kg. Im really worry abt her weight otherthan she’s active but so so lean. Low immunity I tryi many foods for her all very slow weight gain. She had heart problem need one major surgery in that between time I have to gain her weight. Pls mam give me good and healthy food protein chart for her. Really my family worried abt her health. She’s struggling from her side my baby name saayishri. Soon u will give me reply for my msg. Its from one struggli mother words. I feel it is good to see a pediatric dietician for a specialized diet chart. This has to be dealt very carefully as this is a special case. Some wrong diet may end up into something new or we may waste time trying things which may not work out. I am sorry that I am unable to help you. But please search online if you can find a good pediatric dietician in chennai. God bless her. My best wishes. my son is now 3 years old. his low sugar issue is not gone yet.now he is very fussy. May god give you the strength and patience to manage this situation. I would suggest you to move the timings 2 hours early – Breakfast at 8.30 am and so on. There is a reason behind following the sun timings. It is said that the digestive fire goes in sync with the sun timings (sun rise to sun set). The digestive fire is at its peak in the noon by 1, which is the right time to eat lunch. Following these timings help to manage the metabolic problems well. Not following the timings will lead to weight gain and obesity. Actually what he is eating is too less for his age except the biscuits. Plan his diet well based on my suggestions below. Make a chart first and show it your doctor or dietitian and get the changes done. You can try dalia and even this steel cut oats khichdi. They both are great in reducing the weight and strengthening the body. You must give him green gram sprouts and boiled chana regularly. Find out if you can avoid white rice and move to brown rice. 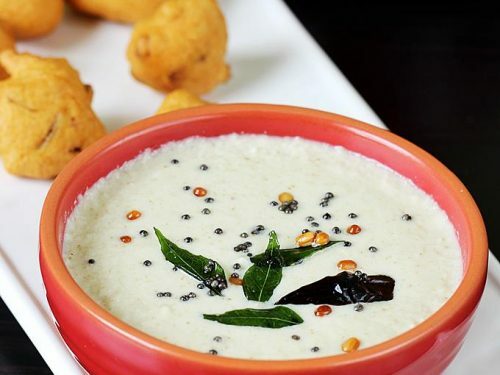 It is great in khichdi and pongal. thanks mam for your reply. I am trying it. mam we asked our doctor about food ; he said give what ever he eats but high carb . no need of special diet .maine ek dietitian ko pucha but unhone sprouts ,small size meal portion dene ke liye kaha ( not helping it much).his current weight is 20-21 . I feel very bad for him , but no other option. Mam normally rice -dal portion mai 2:1 leti ho kya ise 1:1 karu . serving bowl size small karu ? (bowl size 8 oz ka hai utana finish karata hai. some times he eats small paratha. he likes pasta & noodles but its not healthy. can I make a chart & show to you because your ideas & recipes helping me . Actually for kids whether lean or fat we give 1:1 rice:dal. 8 oz is just fine. I think you should try kabuli chana, not sure regarding the carbs part but helps in weight loss, strengthens & tones the body. yes you can send me the chart I can respond on the mail. I feel bad to keep you waiting on the blog as it takes so long for me to reply the comments. My email id is in the about page. Thank you so much for sharing healthy recipes. Your blog has been a boon in my life. I have been trying your recipes for quite sometime now, especially the baby and toddler recipes. I have been able to feed homemade healthy food for my baby since she turned 6 months- all thanks to you. Now she is 16 months. I live in the US and am planning to travel to India in a couple of months. I am worried about planning her food for travel since I do not want to feed her flight/outside food. I would love to know if there are any travel food recipes so that I could plan her meal and carry the homemade food with me on the flight. I appreciate your time. You are welcome. Glad to know the recipes were useful. Thanks a lot for trying. You can dry roast poha, blanched almonds or cashews until crisp. Powder them and then pass them through a fine flour sieve. 4 to 6 tbsps of this powder makes 1 serving. Just mix it with formula or pediasure or any other milk powder you are currently using. Soaking this for a while gives a very smooth texture. You can do the same with cornflakes or popped amaranth with some almonds and cashews. These will not be very heavy and may make the little one hungry with in 2 1/2 hours. Both these have been tried and tested for both for my babies and has helped me manage well while travelling for 24 to 36 hours. 1 solid feed then after 2 1/2 hours, 1 formula feed and then after 2 1/2 hours a light snack – This pattern will work out well. If i remember more ideas I will update this comment so you can check back here. Hope this helps. Thank you Swasthi. Could you help me with the quantities/ratio for making the powders? How much of poha/popped amaranth/ cornflakes, and cashews & almonds are to be used to make the powders? Also I haven’t used formula or milk powder till now. I started feeding her cow’s milk when she turned one. 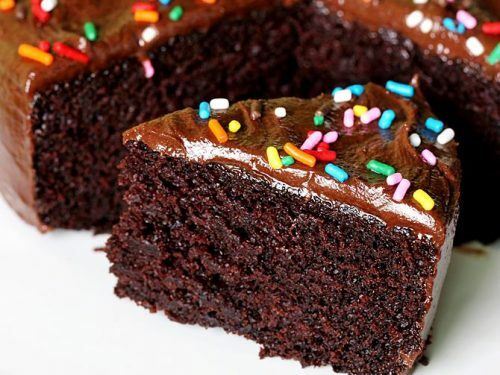 Is there a substitute for formula/milk powder in the recipe? Also I might have to think about what to feed her as a milk substitute when on the flight. I would like to have your suggestions. I am sorry for the late reply. Regarding the quantities please experiment and check what goes well with your toddler. As a substitute to milk you can use fruit. Just mash up the fruit and add little water and then the powder. I avoid all sorts of fruits during travel as they sometimes cause cold and cough very quickly. I avoid fruits from the time I leave home until I reach the final destination. Fruits come from different places and usually tend to cause cold or cough during journey. But check with your elders if what I think is right? I think it is good you give a try with some formula as this is going to help you through out your stay in India. Introducing new brand of milk after you reach India may create problems. I haven’t fed my kids milk in India until they turned 5 just to be on the safer side. I always used to carry formula. Not sure if you will like my ideas but this has helped me to manage them well without the need to see a doctor in India anytime. Thanks Swasthi. That helps and gives me some clarity on what to pack. Also, in one of your posts you have suggested not to feed Tetra pack milk for toddlers. I would like to know the reason. Thanks! According to my findings, the material from the packing leaches toxins to the milk. To experiment, pour 1 full carton of tetra milk to a large bowl. Leave it undisturbed without covering in a well-lit place (preferably near a window). After 20 to 40 mins, carefully look at the top portion of milk, you can see a very very light silver layer or a partial layer. This is visible only from certain angles. Top angle may not show you this. Try looking for it from all other angles, you can see this. I checked this with many premium brands and recently packed cartons. My sis living in the US had warned me about this 12 years ago. So I checked if it happens the same here. Do experiment with the brand you are planning to use. Technology keeps upgrading, this may or may not be true currently. There may be better packing materials used currently. Thanks Swasthi! That’s useful information about the tetra pack milk. I’ll see if the current packaging has got the same problem. Thanks for very useful tips n guideline really nice recipes..n pls add d information abt foods vitamins n which food can help in gaining weight early so many babies fussy in eating n cant maintains weight. This article of yours is great! I just need a few recipes with chicken, fish and mutton to add into the food chart. Thank you.Yes I will try to share them. I do not even know how I ended up here, but I thought this post was great. I do not know who you are but definitely you’re going to a famous blogger if you are not already ?? Cheers! I feel cooking separately for toddlers at least till they complete 2 years has many benefits. The reason is family food is usually high in oil, spice, tamarind and salt. Many times they end up eating less veggies or dal due to this. So I always use to cook the rice, dal and veggies like khichdi separately for the todd. Then pour little sambar, curry, rasam, etc. This way it doesn’t turn too oily or spicy. It will also be less in salt. The kid will slowly get used to our foods. Hope this helps. I shal surely follow ur suggestions…. Dearest ma’am, I can’t thank you enough for this list. Iv added the link to my home screen. Time n again i was being advised to offer varied foods to my 9 m old baby to prevent monotony and fuss. But I was at loss about what all to give her as I was not sure if all that we elders eat everyday could be given to her or not. This list from a food blogger and an experienced mom of young kids has come as a boon. Thank you very much. very glad to know this post is useful. Thanks a lot. Nice article, definetely I am going to try some recipes. I must, but however, cannot thank you enough for these life saving recipes. I’ve been too worried about my baby’s diet and this has given me hope. Thank you, my dear.